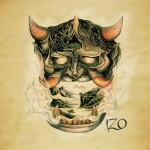 Izo is a pretty new instrumental four piece band from Leece playing tuned down heavy stoner doom stuff. A genre that is really hard these days to come up with a new and interesting sound. The IZO intro is pretty cool that starts the CD off with some effects on one of the guitars and strange vocals and then it kicks directly into We are what we Are and the heavy doom begins. One guitar plays the heavy riff and the other something more melodic and then the riffing becomes more intense as it builds up and then slows down again around 2mins. The band does not really like guitar solos and goes mainly for just heavy riffing and some melodic lines or repeated parts. This one ends heavy and doomy like it started but mostly a high energy stoner like track. Hikikomori starts off like a post rock track with some spacey synth like sounds (not one is credited so probably a guitar pedal of sorts) and at about 1:30, the heavy doomy riff kicks in. They speed it up a bit but this one is more or less a pure riff monster until the 5min mark when the bass line and synth (guitar) take the track to the next phase of the long track. Very cool change and then back to the heavy stuff at 7:30 until the end. Kikusai is a slow builder with some nice melodic guitars for the first 4 and half mins and then a more stoner rock groove kicks in and there is a short solo section. euTONEsia is the last real track on the album and starts with some nice melodic guitars again as it slowly grows and gets more and more intense starting at around 2mins and they really kick up the energy at 4mins and yes… a guitar solo section a min before the end.. MudMut is a sort of outro piece. Check this new Italian band out!! © 2015 IZŌ. All rights reserved.